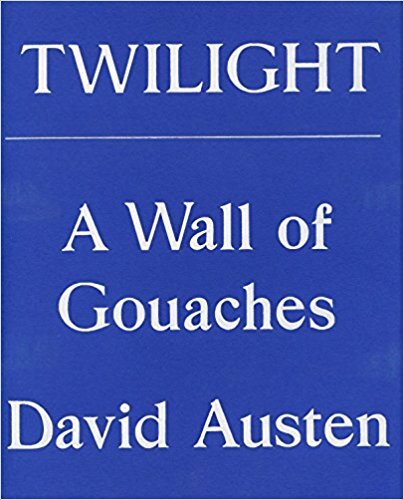 This softcover book published by Ingleby Gallery celebrates David Austen’s major new thirty-part work on paper, Twilight. The making of exquisite works on paper has been at the heart of David’s practice throughout his career, continuing in parallel to his activities as a film-maker, sculptor and painter. The book beautifully illustrates the individual elements of the Twilight installation and includes reproductions of Austen’s atmospheric black and white photographs. David Austen (b.1960, Harlow) lives and works in London. Graduated from the Royal College of Art (1985); and Maidstone College (1981). Awards include the Bryan Robertson Award (2011); and the Stanley Picker Fellowship at Kingston University (2008-09). Select solo exhibitions include Underworld David Austen, Dundee Contemporary Arts, Dundee (2019); The Light That Fell Upon Us Burned, Ingleby Gallery at Art Basel Miami Beach, Miami (2016); Black Heart, MACC, Basilicata (2015); The Gorgon’s Dream at The Burns Monument, Ingleby Gallery at the Edinburgh International Film Festival, Edinburgh, and Rob Tufnell, London (2012); Papillon, Anthony Reynolds Gallery, London (2011); Smoke Town, Edinburgh billboard, Ingleby Gallery, Edinburgh (2011); End of Love, Modern Art Gallery Oxford, Oxford (2010); Man Smoking, Schiavo Mazzonis Gallery, Rome (2009); My love, I have been digging up my own bones in the garden again, Ingleby Gallery, Edinburgh (2009); and The End of Love, Stanley Picker Gallery, Kingston University, Kingston-Upon-Thames (2009). Select group exhibitions include Cosmic Connections, TOTAH, New York (2016); The Nakeds, Drawing Room, London (2014); Slow Learner, Timothy Taylor Gallery, London (2014); Just what is it that makes today’s homes so different, so appealing?, New Art Centre, Salisbury (2013); Language Games. An Introduction to The Art of Our Times, Fundación Helga de Alvear, Cáceres (2013); With An Apple I Will Astonish, Large Glass, London (2012); Artists for Kettle’s Yard, Kettle’s Yard, Cambridge (2011); and Watercolour, Tate Britain, London (2011).